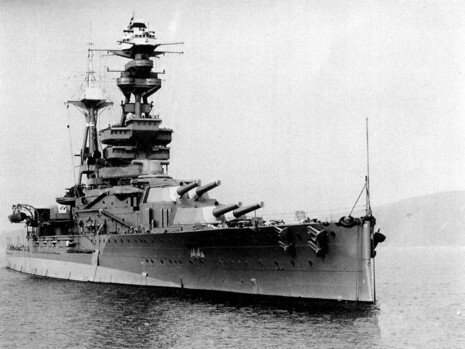 HMS Royal Oak (pennant number 08) was a Revenge-class battleship of the British Royal Navy, torpedoed at anchor by the German submarine U-47 on 14 October 1939. Launched in 1914 and completed in 1916, Royal Oak first saw action at the Battle of Jutland. In peacetime, she served in the Atlantic, Home and Mediterranean fleets, coming under accidental attack on more than one occasion. The ship became the centre of worldwide attention in 1928 when her senior officers were controversially court-martialled. During a twenty-five year career, attempts to modernise Royal Oak could not address her fundamental lack of speed, and by the start of the Second World War, she was no longer suited to front-line duty. 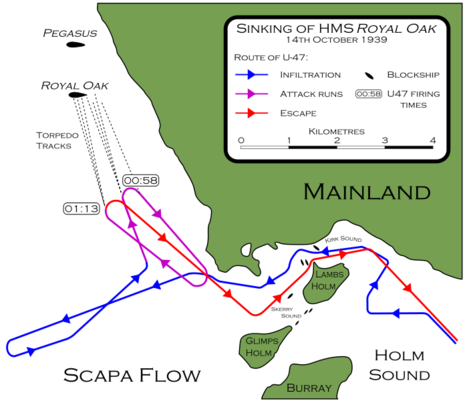 Royal Oak was anchored at Scapa Flow in Orkney, Scotland when she became the first of the five Royal Navy battleships and battlecruisers sunk in the Second World War. The loss of life was heavy: of Royal Oak's complement of 1,234 men, 833 were killed that night or died later of their wounds. The numerical superiority enjoyed by the British navy and its Allies meant that the loss of the veteran of the First World War made little difference to the naval balance of power, but the effect on wartime morale was considerable. The raid made an immediate celebrity and war hero out of the U-boat commander, Günther Prien, and on his return to Germany he became the first Kriegsmarine submarine officer to be awarded the Knight's Cross of the Iron Cross. To the British, the raid demonstrated that the Germans were capable of bringing the naval war to their home waters, and the shock resulted in rapidly arranged changes to dockland security. 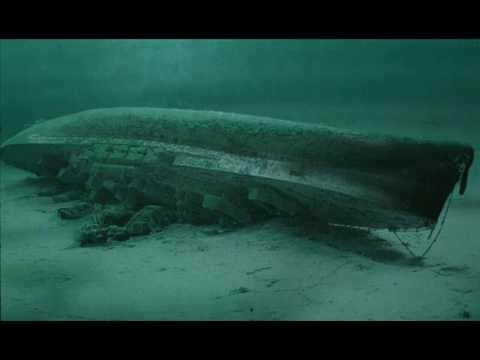 Now lying upside-down in 30 m of water with her hull 5 m beneath the surface, Royal Oak is a designated war grave. In an annual ceremony to mark the loss of the ship, Royal Navy divers place a White Ensign underwater at her stern. Unauthorised divers are prohibited from approaching the wreck at any time.